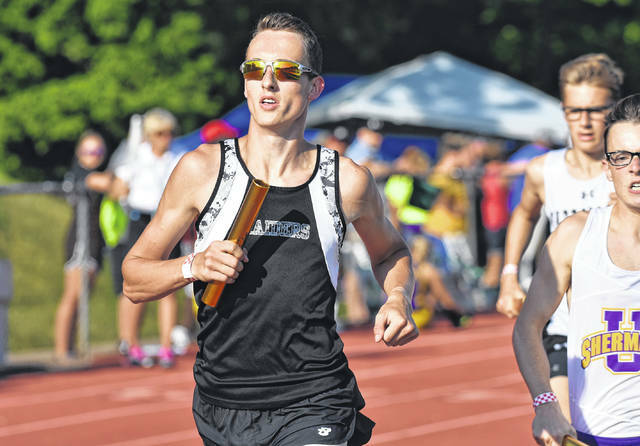 River Valley senior Nathaniel Abbott hits full stride during the Division II Region 7 4x800m relay finals held Thursday, May 24, on the campus of Muskingum University in New Concord, Ohio. Gallia Academy senior John Stout hits full stride during the Division II Region 7 200m dash semifinals held Thursday, May 24, on the campus of Muskingum University in New Concord, Ohio. COLUMBUS, Ohio — Four schools, one common goal. To finish as high atop the podium as possible … if possible. Athletes from Eastern, Gallia Academy, Meigs and River Valley will all take part in the 2018 OHSAA Track and Field Championships being held this Friday and Saturday at Jesse Owens Memorial Stadium on the campus of Ohio State University. The quartet of Ohio Valley Publishing programs have a combined half-dozen competitors taking part in this weekend’s festivities, with Eastern accounting for half of the area’s entrants. EHS is also the only local school to have athletes competing in both the boys and girls meets. Of the six local state qualifiers, four boys will be making their official debuts at Jesse Owens Stadium while a pair of girls are appearing for the third time apiece in their respective careers. Meigs junior Kassidy Betzing is making her third consecutive state appearance in the Division II long jump event and enters the Saturday competition with the fourth-best regional mark of 17 feet, 5¾ inches. Betzing — who owns the TVC Ohio (17-7½) and D-2 Southeast District (18-7) records in this event — placed seventh as a freshman and was the overall runner-up last spring. Betzing was also a member of last year’s eighth-place 4x100m relay team. Betzing has scored at least one point at the state level in each of her first two seasons, giving the Lady Marauders the longest such streak of any program on the Ohio side of the OVP area. MHS had previously gone six consecutive postseasons — dating back to the 2009 meet — without scoring at the Division II girls competition. Jessica Cook is also headed back to Columbus after a one-year hiatus, as the Eastern senior qualified for the Division III 800m run final for the second time in her career. Cook — who was 16th in 800m event as a sophomore — enters Saturday’s final with the 17th-best qualifying time of 2:24.02. The Shawnee State University signee also competed in both the 1600m final (12th) and 4x800m relay (13th) during her freshman campaign. Cook — a three-time Division III state qualifier in cross country — is also the only hope for the Lady Eagles to score at the state meet for a third time in five seasons, as well as in consecutive years. The Lady Eagles lead all Ohio-based programs with at least one representative at each state tournament since the 2010 campaign. A traditional program will be absent from the 2018 girls meet as Gallia Academy will not have a single female competitor at the state level since at least the mid-1990s. Starting in 1997, the Blue Angels had scored at least one point in 20 of the previous 21 Division II tournaments. The Eagles have a pair of boys competing at Jesse Owens for the first time in their respective careers as senior Tyler Davis and junior Noah Browning are respectively in the Division III shot put and 400m dash events. Davis has the 15th-best regional mark of 48 feet, 2½ inches in the 16-person field on Friday afternoon, while Browning owns slowest time of 51.48 seconds in the second of two semifinals on Friday morning. Nine athletes will advance to the 400m dash final on Saturday afternoon. The Eagles haven’t scored at the state level since Tyler Cline finished fourth (5 points) in the discus back in 2012. EHS also hasn’t scored a point in a running event at the Division III boys meet since Kyle Connery placed fourth in the 400m dash back in 2011. 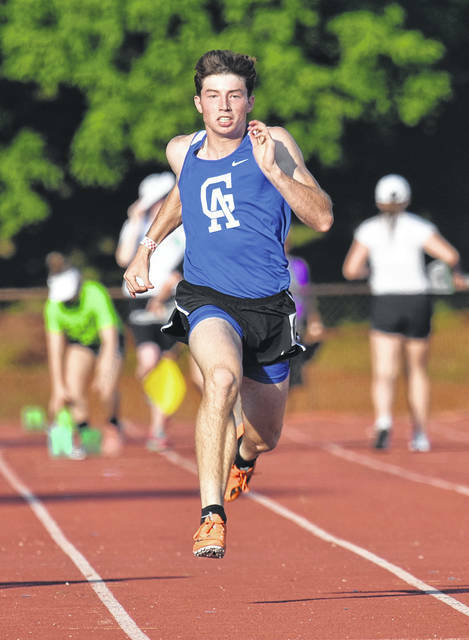 The Raiders have a state entry for the third time in four years as senior Nathaniel Abbott will compete in the 800m run final on Saturday afternoon. Abbott — a Marshall University signee — owns the 13th-best time of 1:57.15 out of the 18 state participants in the D-2 race. River Valley — as a program — hasn’t scored at the state level since Jessica Hager was eighth in the 300m hurdles back in 2011. The Raiders haven’t scored at the boys state meet since Charles Peck placed fourth (4 points) in the 100m dash back in 1993. The Blue Devils will be represented at the state meet by senior John Stout, who primarily played baseball before splitting time with both programs this spring. Stout — at 22.63 seconds — owns the 8th-fastest time in his semifinal heat of the Division II 200m dash on Friday, as well as the 15th-best mark out of 18 total competitors. Nine athletes will advance to the 200m dash final on Saturday afternoon. Gallia Academy will have at least one male athlete at the D-2 meet for a fifth consecutive postseason, but the Blue Devils haven’t scored a single point since Logan Allison won the long jump and Jacob Click placed fourth in the 300m hurdles back in 2014. Neither Southern nor South Gallia have a state qualifier at the 2018 meet this weekend. SHS last appeared at state in 2015 when Jaylen Blanks competed in the Division III 200m dash semifinals. SGHS has never produced a state qualifier in the program’s existence. The 2018 OHSAA Track and Field Championships start at 9:30 a.m. on both Friday and Saturday at Jesse Owens Memorial Stadium.